Rescue Silsailen villagers from a Heritance attack. Silsailen — Help repel the attackers invading the town of Silsailen. The town of Silsailen is under attack by imposters disguised as First Auridon Marines. The townspeople suspect these men and woman are a part of a group called the Veiled Heritance. (Optional) Talk to Ilemin, Aldunie, Watchman Cirdur or Sarodor. Find Teldur and pick up the bucket. If you travel close enough to Silsailen, Ilemin will run up to you, yelling for help. "They've burned the town! Please, please help us!" "A group of soldiers came to town. They were dressed like the Marines, but... they set fire to the buildings! I heard someone say they were really part of the Veiled Heritance, that splinter group." You should get clear. Who should I talk to? "The Canonreeve's daughter, Elenwen, organized an evacuation. Last I saw, she was heading for the barn on the west side of town. Go quickly, please!" Alternatively Watchman Cirdur can give the quest, as can Aldunie. Missing dialogue These NPCs only give the quest if you have completed A Hostile Situation. It is possible to bypass these NPCs and pick up the quest from Elenwen directly. Find Elenwen on the outskirts of Silsailen, just across the bridge to the west. "We need to get this madness under control." "Can't you smell the smoke? Silsailen is under attack! I barely got my father out alive! The Canonreeve, almost slain! These brutes may wear the uniforms of the First Auridon Marines, but they're imposters." "They're agents of the Veiled Heritance. I'm sure of it! Teldur, my father's assistant, is trying to organize a defense. You look capable. Will you help Silsailen?" I'll find Teldur at once. Teldur, her father's assistant, is organizing a defense from within Silsailen itself, so go find him. He is by the well in the center of town. "Are you insane? Can't you see the town is under attack?" Elenwen sent me to help. "Did she? How do I know you're not one of the imposters?" Look, do you want me to help or not? "Fine. Grab that bucket from the well and put out the fires. If you find any villagers, tell them they need to evacuate until it's safe. What are you waiting for? Move like you have a purpose!" "Refuse to answer an outsider's pointless questions, for one. I'll catch up with you at the barn later. Now go!" Interact with the nearby well to get a Bucket of Water. You now have to save five villagers within Silsailen. Despite Teldur's words, you don't have to douse any fires at all; just activate the bucket, then find five villagers each being menaced by a Heritance soldier (they are scattered about the area, mostly behind the buildings) and kill the enemies one by one. Or, if you like, you may douse the fires, though these are also guarded by Heritance soldiers you will have to fight. 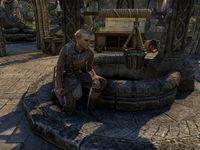 Once five villagers have been saved, report back to Elenwen, who is in the barn south of where she had been standing previously, to complete the quest. "The fires are under control, thanks to you." I saved as many villagers as I could. "We'll be a long time in rebuilding, but your bravery won't be forgotten." You can then speak to Hanilan to find out who was behind the attack. Sarodor asked me to speak to Elenwen about helping in Silsailen. Elenwen has asked that I speak to Teldur about rescuing the remaining villagers. Teldur told me that several villagers are still trapped by the guards or fires. I can get water from the well to put out the fires. Finishes quest I rescued the townspeople trapped in Silsailen. Now I should speak with Elenwen at the barn outside of town. This page was last modified on 6 April 2019, at 13:39.